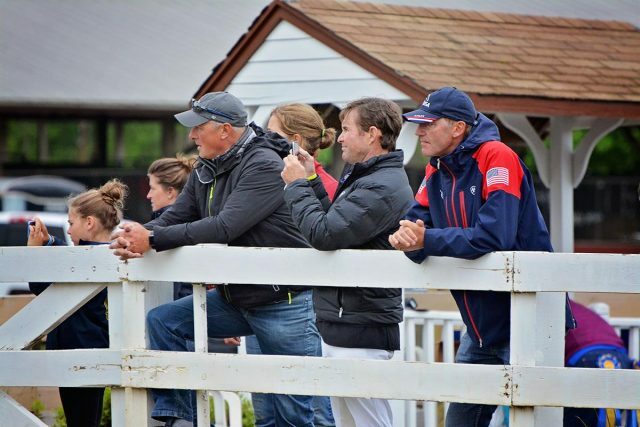 Proud father Phillip Dutton records a video of his 16-year-old daughter Olivia’s show jumping round with Mr. Medicott, flanked by the watchful eyes of show jumping coach Richard Picken on the left and U.S. Eventing High Performance Director Erik Duvander on the right. Photo by Jenni Autry. Hello, fabulous EN readers! Welcome back to another installment of my Reporter’s Notebook, in which I bring you behind-the-scenes tidbits that might not have made it into EN’s actual event coverage. Feel free to pepper me with questions in the comments if I don’t address a topic that has you scratching your head. Let’s dive right in to what you need to know following the Jersey Fresh International Three-Day Event, presented by B.W. Furlong & Associates, held May 9-13 at the Horse Park of New Jersey in Allentown, New Jersey. Jersey Fresh has long been a labor of love for those local to the Mid-Atlantic venue. The 2018 event marked the 16th running of Jersey Fresh, and while this year’s competition boasted numerous improvements, the most popular by far had to be the new competitor hospitality tent sponsored by Boehringer Ingelheim Equine Health. The tent provided breakfast and lunch each day of the competition, plus pizza, beer and wine after cross country. In addition to the food, which was greatly appreciated by all — as Hawley Bennett-Awad so aptly noted: “Eventers love snacks!” — the tent also provided a furnished lounge, wifi and charging stations to sit and take a breather. EN travels to every major event in North America, and I can easily say Boehringer Ingelheim provided the best competitor hospitality tent I have seen on this side of the world. With 145 competitors, it was no small feat to feed a slew of hungry eventers and their support teams. Our hats are off to Boehringer Ingelheim for providing such an incredible service to Jersey Fresh. This year’s running of Jersey Fresh also marked the completion of the first stage of improvements to the Grand Prix Arena, which continues to undergo major footing refurbishments. The new footing had not quite settled enough to host show jumping on Sunday, which didn’t faze new show jumping course designer Chris Barnard one bit. He swiftly drew up new courses for the smaller arena next to the pavilion, which mercifully provided cover from rain for spectators and competitors alike during torrential downpours on Sunday. The cross country course at the Horse Park of New Jersey has also received a major overhaul over the past two years, with the acquisition of additional acreage allowing for a new loop on the beginning of the track. This year the venue also unveiled 10 new cross country jumps thanks to the generosity of B.W. Furlong & Associates. Capt. Mark Phillips returned for a second year as course designer at Jersey Fresh, with Morgan Rowsell serving as two-star co-designer this year. Considering the limited space available to lay out CCI tracks at this venue, the riders agreed the designers used the land as effectively as they could. The lack of space to lay true galloping tracks means riders are spinning a lot of circles, and I had a sneaking suspicion walking the courses that we were going to see some riders missing jumps due to the sheer confusion of it all. In fairness to Boyd, that is a lot of remembering to do. Announcer extraordinaire Brian O’Connor wondered how many cross country jumps Boyd tackled between his six rides. I promised Brian I would tally it up: Boyd jumped 217 total fences on cross country day at Jersey Fresh. Saturday was also a very safe day of cross country at Jersey Fresh, without a single horse fall in the 133 total starters that set out on course. We saw only two rider falls across all divisions and no injuries as a result. 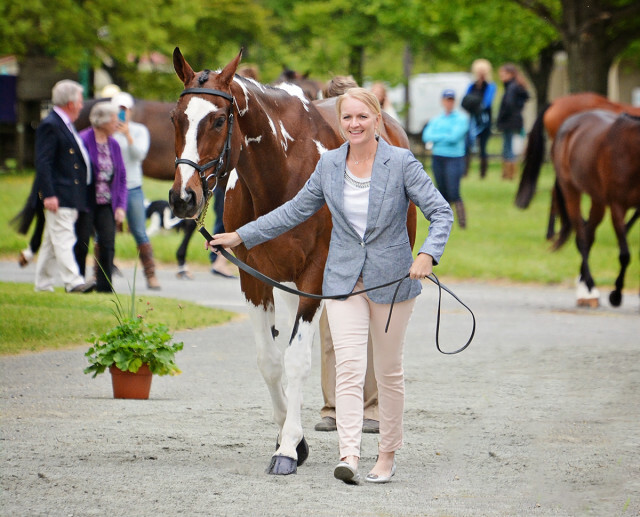 Phillipa Humphreys and Rich N Famous at the Jersey Fresh first horse inspection on Wednesday, May 11, 2016. Photo by Jenni Autry. It is impossible to reflect on Jersey Fresh without thinking of Philippa Humphreys, who we lost two years ago at this event in a rotational fall on CCI3* cross country. Jersey Fresh always falls on Mother’s Day weekend, and Sunday at the event was punctuated by a poignant underlying heartache knowing Philippa’s now 2-year-old daughter, Millie, will grow up without her mother. As part of the award, a donation in the winner’s name is made to Millie’s college fund, which currently sits at $107,069 of the total $125,000 goal. To all those who are able to donate to Millie’s college fund, please consider doing so in Philippa’s honor. Click here to catch up on all of EN’s coverage from Jersey Fresh. Go Eventing.